Constantinopolis by James Shipman is available at Amazon. 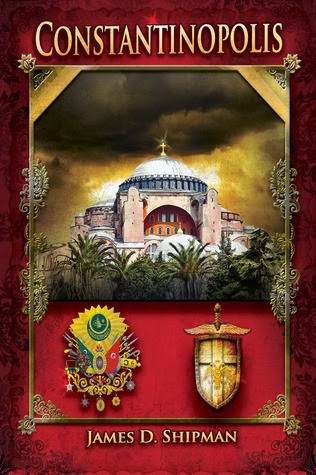 In 1453 Constantinople is the impregnable jewel of the East. It has stood as the greatest Christian city for a millennium as hordes have crashed fruitlessly against its walls. But Mehmet II, the youthful Sultan of the Ottoman Turks, has besieged the city. His opponent is Constantine XI, the wise and capable ruler of the crumbling Eastern Roman Empire. Mehmet, distrusted by his people and hated by his Grand Vizer, must accomplish what all those before him have failed to do: capture Constantinople. To prove that he deserves the throne that his father once took from him, Mehmet, against all advice, storms the city. If he fails, he will not only have failed himself and his people, but he will surely lose his life. On the other side of the city walls, the emperor Constantine must find a way to stop the greatest army in the medieval world. To finance his defenses, he becomes a beggar to the Pope, the Italian city-states, and the Hungarians. But the price for aid is high: The Pope demands the Greeks reunite the Eastern and Western churches and accept the Latin faith. If Constantine wants aid for his people he must choose between their lives and their souls. Two leaders, two peoples, two faiths battle for their future before the mighty walls of Constantinople. I received a free copy of this book from Library Thing in exchange for a review. Initially, the book sucked me in and I finished the story in two days. Shipman does a great job taking what's often delivered as dry fact and turning it into action. But. I wish more facts made it into the story because this turned out to be more historical-fantasy than historical-fiction. The story needs more editing to weed out the typos and repetitive passages. The characters need a little work, the historical figures are one-dimensional: Constantine is the overly romanticized hero and Mehmet is the stereotypical narcissistic villain. I wish we'd seen both the good and bad sides of each characters so that they'd feel like the real historical figures that they are. One character is entirely fictional; Zophia's supposed to represent the Greek spirit but she feels like an actress over-acting her role. I would love to see the author take this story and flesh it out with more facts to support his speculations. The writing has potential - Shipman is able to convey ideas in a way that doesn't read dryly. I just wish this story had more meat on its bones.